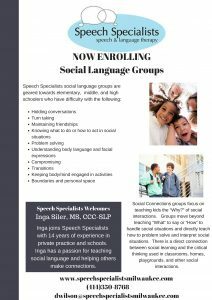 Speech Specialists is dedicated to providing speech therapy integrating the most up-to-date treatment techniques with a holistic approach. We believe that everyone should be guaranteed the opportunity to develop their communication skills to their full potential. 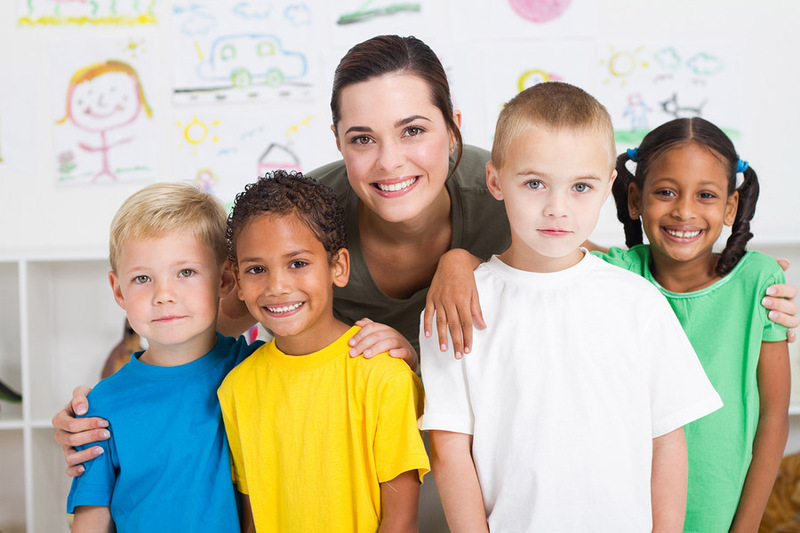 Our comprehensive programs are designed to meet the individual needs of both children and adults. We specialize in clinical speech and language services for children. Speech Specialists emphasizes family involvement and education and believes that considering the child’s family life, home and school environments, self-esteem and emotional development is vital for effective treatment. 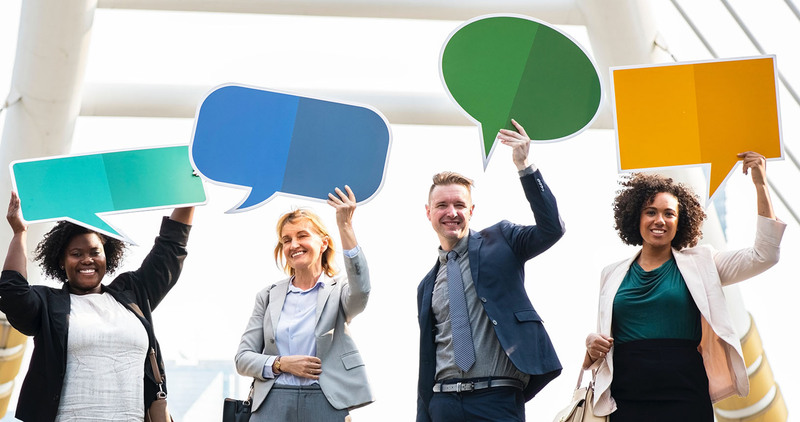 Speech Specialists provides clinical speech therapy, corporate speech training and accent modification services for adults. Our clients often come to us when they have difficulty communicating with their peers, customers, patients, or families. We provide individual or group sessions. I loved the educational materials and ease of sessions at home. I was concerned that my son would regress over the summer, but with Speech Specialists he actually made a great deal of progress! The relationship Dawn formed with my son made him comfortable from the start. We have seen tremendous progress in our daughter’s speech since working with Speech Specialists. Dawn brings her expertise in speech therapy to our daughter in a fun, interactive and energizing play-based setting. Amazing! Dawn was firm when needed, engaging, and helped Julian so much. In 7 months, he went from being significantly behind his peers with all associated behavioral issues to a much more ready-to-learn senior kindergartener. She helped him (and us) clear the hurdles of a speech delay and Julian, being a bright kid, will do the rest. Dawn’s ability to make the lessons fun for my daughter is fantastic! My daughter looks forward to seeing and working with Dawn. Dawn has an incredible variety of games and activities geared toward my daughter’s age level. I feel confident she will greatly improve under Dawn’s care. Dawn has been absolutely spectacular. Ryan really looks forward to his sessions with her and brings his lessons home so that our family has noticed tremendous improvement in Ryan’s language and comprehension. 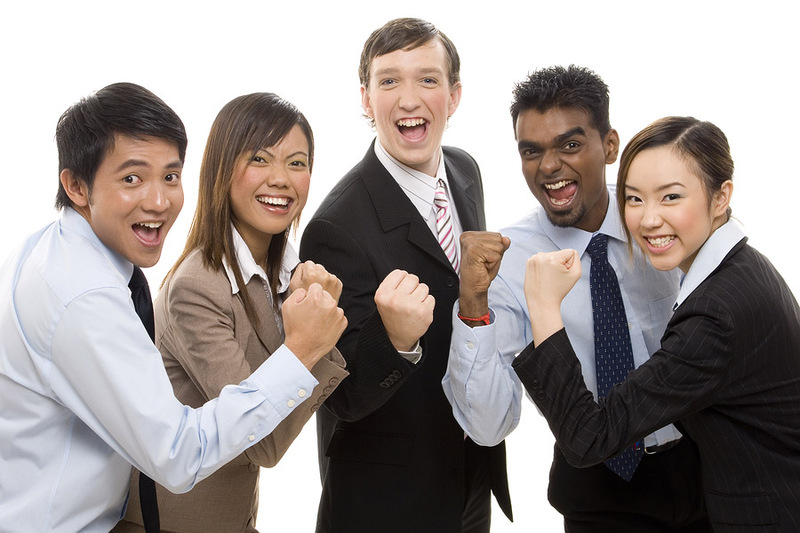 I am more confident at work and my friends and coworkers tell me that they can understand me much better! I wish I would have done it sooner! Speech Specialists has provided my family with hope- that our son will communicate with us, have a dialogue with us and progress to the level he should be at academically! I wish we would have contacted Dawn sooner! I was amazed at Jack’s progress in 5 months. He became much more confident when communicating both at home and school. Great overall experience for my son and our family. I would not hesitate to engage Speech Specialists again. Working with Dawn was an excellent experience. In six short months, she had our three-year-old pronouncing all her letters and sounds. Our daughter can now communicate without any trouble or frustration, allowing her to more easily learn and grow. Dawn’s approach to solving our daughter’s speech problem was fun and interactive. I appreciated Dawn’s professionalism, and the time she spent with me as a parent to make me aware and involved in my daughter’s therapy. Dawn did a fantastic job–fun learning for our child and helpful tips for us. We saw immediate results and highly recommend Dawn and her speech skills. Fantastic overall experience! The therapy was a success and my daughter will always LOVE Mrs. Wilson. Thank you! My daughter loved her time with Dawn! She was excited to go everytime. I appreciated knowing she was learning while she was having fun. It was very comforting to work with her. Dawn is very nurturing and provided a safe place for my daughter to be herself. At the same time, it was easy to see that Dawn is highly intelligent and skilled! Dawn’s professionalism and skill are superior. We have been so pleased with our experience with Speech Specialists. Our son truly enjoys his sessions and in addition to learning many strategies, he has gained confidence in his ability to communicate. Not only has our son learned valuable skills and helpful strategies to utilize when he is disfluent, but I have learned how to be more helpful and supportive as well. It is clear that Dawn is knowledgeable of best practices for disfluency and is up to date with current research. Plus, she is highly regarded by her colleagues. I would easily and confidently recommend Dawn and her services. 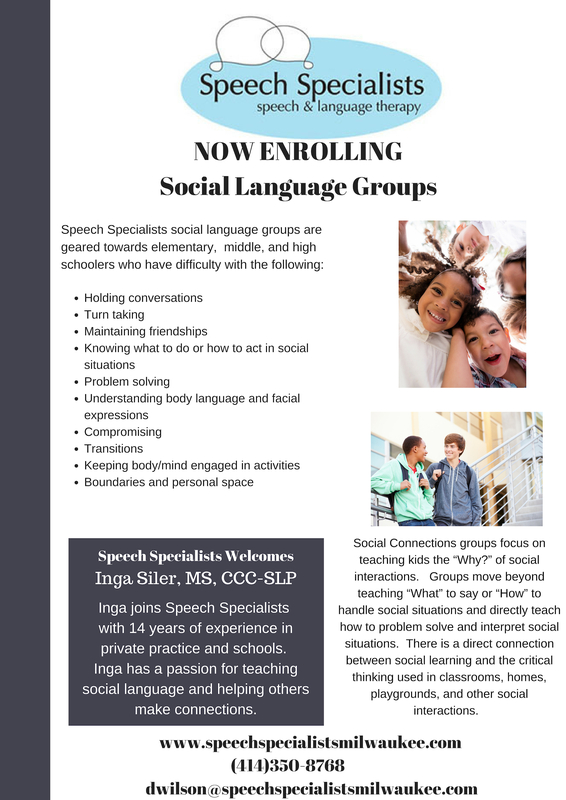 Now offering Social Language Groups for elementary, middle school and high school students! Sessions consist of 6 one-hour classes and are held in groups of 2-5 students. Please contact us for details and to reserve a spot! © 2009-2018 Speech Specialists Milwaukee. All Rights Reserved.